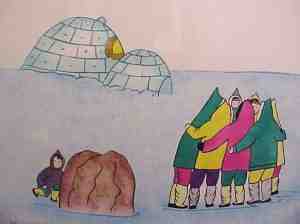 Folks, for a few days we are going to be looking at some of these marvelous works by Inuit (Eskimo) and Cree artists. These are currently featured at the Canada House website. If ever in Banff, this would be a cool place to visit. The website is well worth a visit now, as it features an extensive and well-done on-line art gallery.